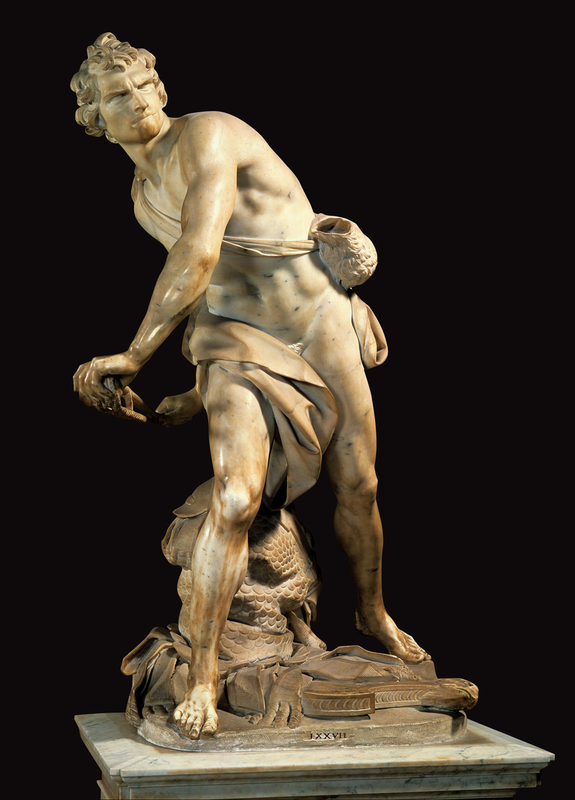 I checked out your site and was very impressed with your craft (he makes whips as one would assume by his name). Interestingly enough, I was at my local leather dealer this morning purchasing supplies for a new sling I’m throwing together. Just recently I braided some deerskin strips to make the arms for that sling and I had to grab some more brass rings for it at the shop. Unfortunately, I have a lack of braiding knowledge and the arms didn’t turn out too pretty (although I’m sure they’ll work fine). While at the leather shop, I asked the owner if he could recommend a type of leather for braiding. He told me that kangaroo leather was the best, and to illustrate he pulled out a braided kangaroo whip from behind the counter. 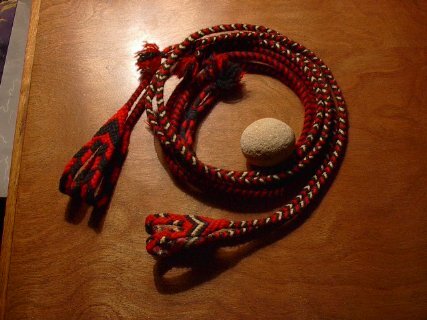 Similar to the whips on your site, the leather was very well braided in a tightly woven pattern. I was just curious if you have ever tried some similar braids for sling arms. If so/not, do you think it would work well. Aesthetically it would kick A**, functionally I’m not sure. I’m guessing that you have had a lot of experience with this sort of thing. What do you think? Bark tanned kangaroo leather is by far the best leather for braiding on the planet. Strands can be cut very thin, under 1/8" if wanted. There have been bullwhips made with 36 or more strands in the overlay! See David Morgan's book Whips and Whipmaking. Kangaroo leather is a stiff tuff leather, very thin, and so strong that even fine strands have incredible tensil strength. I've made a sling with a kangaroo hide pouch and bootstring arms. I made it back before I had a good supply of leather, years ago, so I didn't try the plaited (braided) thongs at that point. The braided thongs should make you a first class sling. When done right they won't twist, thus eliminating all tangling during use. I remember when I made my first braided sling out of yarn. Because it didn't twist in use, my releases became so smooth. I had been used to the boot strings and this was so much nicer. The braided leather will be the same. It's durability should last for years too. Deer skin can tend to be spongy and soft and very difficult to cut smoothly or braid tightly. I've heard that indian tan buckskin, though similar in some ways, is very very durable. or www.davidmorgan.com ; Siegel has more color choices. Drum stuffed is better than greasy but both will work. As I see it, you can use several different techniques to make such a sling but if you want the thongs to come directly off the pouch without attaching them later, then cut out something like this from the perimeter of a trimmed and stretched hide. 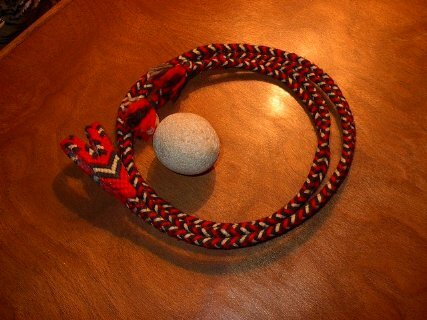 Here is a picture of my favorite sling, with my favorite rock I made it out of some good yarn and the braids are done with 8 strands over a 4 strand core. They are quite stiff and really nice. The pouch is made doing a knotting technique used for friendship bands and the only draw back is that the edges of the pouch where it transitions into the thongs, is wearing out from the friction of releasing the rocks. I put some glue on the inside as a surface to protect it and it seems to be working. Chris generously put my sling up so I could use it here. And here it is again, with my baseball, practice sling. Soon I hope to do some more experimentation. I should try a leather sling myself. I would except that I've been handling leather for 10 years now, and I am more excited about textiles at the moment. Good luck on your sling making. Post a picture for us! Aside from learning how to weave the 4 strand round braid, I could make a sling on the info you provided in this post alone. I appreciate that. It will probably be awhile before I devote some time to weaving some kangaroo sling arms, but I'll be sure to save this post in a word document so I can use it later. Your sling is really gorgeous! I really like the textile pattern you used. I'm going to have to take note of how you did the split pouch too, maybe I'll use it on my next sling. I wanted to do a new topic like "who done It?" but don't know how to cut the photos and paste them here. But check out the slings in this thread!